I found myself having an interesting exchange on Facebook a couple of d ays ago, between myself (a Christian who regularly practices yoga–or at least a little-known variant thereof known as pranaholycrapI’mfallingover), a Christian yoga instructor, and another individual. This third person seemed intent on admonishing us for what she considered to be a practice that was not simply a questionable activity from a Christian perspective, but a quite-literally demonic one. I was a little taken aback by the accusation that I was, entirely unbenownst to myself, taking regular dips in the venomous waters of Satanism and, apparently, opening myself to literal demonic possession. And given that the little yoga I do seems so effective in terms of reducing back pain, reducing stress, and increasing muscle strength and flexibility, I was also surprised that demons could be so considerate. So I did a few web searches to find out more about such attitudes, and found that it is almost a commonplace in some corners of uber-conservative Christianity to imagine that practicing yoga, even in the way it’s commonly practiced in health clubs in the U.S., is essentially engaging the worship rituals of another religion (usually identified as Hinduism)–rituals which somehow amount to demonic worship as well. Of course, there are more moderate perspectives as well. Were I to really engage in such arguments, I’d likely start with the idea that what is most often termed “yoga” in the West is not really yoga at all, but rather a combination of two elements of yoga, asanas (the poses) and pranayama (the breathing exercises). While these are essential elements of yoga, they do not begin to encompass the religious dimensions practiced by, say, real yogis and those who intentionally engage in yoga as a religious practice. The relationship of asanas and pranayama to full-on yoga is a bit like the relationship of butter and sugar to chocolate chip cookies: they are essential ingredients of chocolate chip cookies, but it would surely be a mistake to suggest that everything that contains butter and sugar must therefore necessarily be a chocolate chip cookie. It would seem absurd to insist to a chef who intended, for example, to make a rice pudding, and produced something that looked and tasted exactly like rice pudding, that because its primary ingredients are butter and sugar it can be nothing other than a chocolate chip cookie regardless of the chef’s intentions (great, now I’m peckish for both rice pudding and chocolate chip cookies). In any case, I’m not going to engage those sorts of arguments about actual yogic practice here. (My own view is pretty similar to the one expressed in this 2005 Christianity Today article. I do want to address what I think is the more important issue, which is not about the particulars of yoga or any other activity (internal martial arts such as Aikido, for example) that draw on “Eastern” philosophies1, but rather about the ethics of where one goes looking for evil. And because I’m a literature person, that makes me want to talk about Macbeth. Everybody knows about the witches in Macbeth, if only through the “double, double, toil and trouble” line in all its various cultural manifestations. What’s always interested me about the witches in Macbeth, however, is that they seem, to me, to be almost entirely unnecessary to the plot. While the witches seem ominous and powerful, there is nothing in the play that could not happen without their supposed “influence.” It is sometimes argued that the witches “plant” the idea of murdering King Duncan in Macbeth’s mind, but the fact that he picks up on the idea so readily, and moves from suggestion to execution so quickly, seems to indicate that the idea was already very much present in his mind. Early in the play, Lady Macbeth is a much stronger influence in terms of egging Macbeth on to do the deed than the witches ever were. In fact, one can remove the witches’ scenes entirely (some of which most Shakespeare scholars recognize as later interpolations by Thomas Middleton, anyway), and rest of the plot and character motivations in the play still make sense. Even the most bizarre image in the play–when “Birnam wood comes to Dunsinane”–is explained and accomplished by the most mundanely naturalistic means (soldiers disguising themselves with branches). At the end of the day, all the witches really accomplish is the creation of a pot of really, really bad soup. If this is the case, then, what are the witches doing there? Scholars sometimes point to the fact that the play was written during the reign of James I of England (also James VI of Scotland, claiming descent from Banquo himself), who had a sort of obsessive interest in witchcraft. Bear in mind that we’re talking about the early 1600’s here, which was an era of widespread cultural fear about witchcraft. James own book on witchcraft, the Daemonologie supports the practice of witch hunting, and concentrates on the ways that one may determine whether or not an individual is a witch. Shakespeare was certainly aware of this text, as he draws from it and related texts in the play. It’s also important to remember that witchcraft was not the only hot-button issue of the time: for example, there are numerous reference in the play to the then-recent Gunpowder Plot, in which a faction of English Catholics had attempted (and failed) to literally blow up the House of Lords (the king himself present) while it was in session, using barrels of gunpowder planted in the basement. Political intrigue abounded. I’m often tempted to see Shakespeare looking at both his culture and his monarch in light of the existence of their obsessive interest in hunting down witches and demons with the presence of much more mundane–and much more immediately dangerous–forms of evil. In Macbeth, all of the evil actions are easily explained by very mundane, human motivations: ambition, greed, revenge. Even for a present-day audience, it’s easy to blame the events, and the “evil” on which the play certainly meditates, on those “weird sisters”(they’re never referred to as “witches” in the play). They’re the most obvious target: they’re grotesque, mysterious, seem to call on dark powers–and, not insignificantly, they’re apparently females who are not under any kind of male control (the demographic most frequently targeted in period witch hunts: unmarried teens and elderly widows). Yet they still accomplish very little, if anything at all. When I teach the play, generally my students are quick to mention the sisters as a source of evil in the play, and often surprise themselves I ask, “what do the sisters actually do?” and find they have few, if any answers. I suspect this is one of Shakespeare’s points: as the audience of Macbeth, we tend to follow evil in its most stereotypical manifestation, only to find that the real evil in the play doesn’t originate from that stereotypical source. 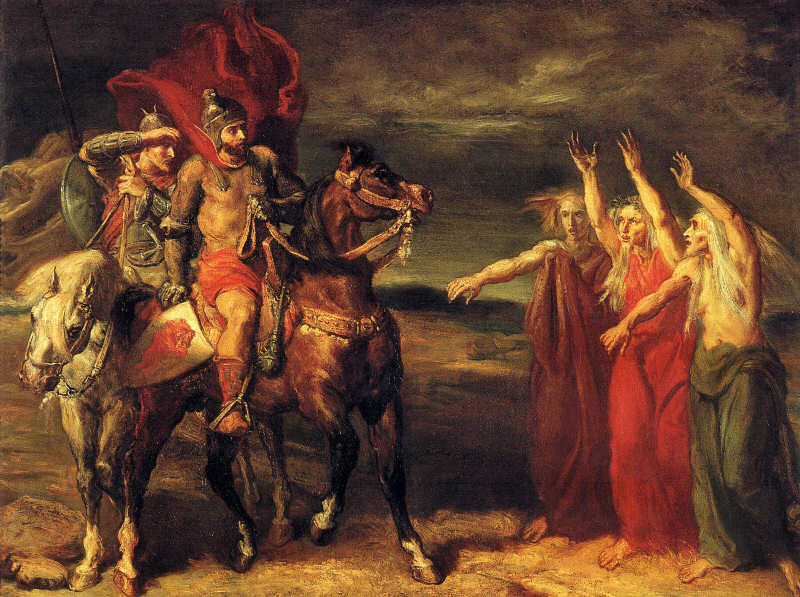 The real evil in Macbeth comes from its very human characters, from Macbeth’s combination of insecurity and ambition, from Lady Macbeth’s fierce love and will for her husband (and later her guilt), from the seemingly inevitable chain of events that seem to flow inexorably from Macbeth’s initial murder of Duncan, from the natural consequences of his usurpation of the crown. From the the guilt of multiple murders, overmatched by the need to continue to hide them. I can easily imagine Shakespeare gently cajoling his audience–and his King–through the combination of these obvious, and obviously banal and human, motives with the ineffective, seeming “witches” in the play, reminding them to be careful where they look for evil. Most often, it doesn’t originate from witches and demons. In a way, that would be nice: witches and demons make the source of the evil obvious, easy to detect, easy to eradicate. But evil is never that easy (if it was, it would hardly be a problem), because most of the time, evil looks just like us, our fears, our ambition, our guilt. We tend to go after “witches” not because they’re the source of the evil we face, but because their grotesque obviousness is easier, for us, than noting where the evil really comes from in ourselves. This in mind, it’s important to recognize that, historically, the ones most often accused and found to be “witches” were anything but: they were most often, as mentioned above, women who existed on the fringes of society, outside of the kind of male authority and protection necessary for safety in early modern England’s very patriarchal culture. In other words, the strong desire in the culture of Shakespeare’s audience to avoid looking within for the real sources of evil led them to look in the easy, external places: the weaker people who lived on the fringes of society who were less able to protect themselves physically and legally from accusations of witchcraft. That culture’s unwillingness to explore the real sources of evil led to countless deaths of the most vulnerable and disenfranchised among them. The very people the central figure of their own religion exhorted them to care for the most. In other words, the most “demonic” quality of Shakespeare’s culture was its ability to create its own demons, the demons it used to avoid dealing with its own, much more banal, evils. I think this is what bothered me the most about such seemingly strong desire to hunt down “demonic” influence in practices that originate in cultures other than one’s own. It’s much more likely that evil lives much closer to home, much closer to one’s own heart. That it arises, most insidiously, from the impulse to avoid searching for the evil in one’s own ambition and fear by displacing it onto some external target, a target created by ourselves, made visible by the way we ourselves have projected difference on to it. At the end of the day, it’s not the yoga–the other, the immigrant, the LGBT person, the foreigner–that is evil. It’s our own ability to project evil on to such innocent targets and destroy them rather than to face and to take responsibility for the demons of fear that already live within us.